The use of indigenous language names for the scientific names of species is a great way of recognising traditional knowledge of species by indigenous people. When Harry Parnaby described the New Georgia monkey-faced bat for western science in 2002, he incorporated the Vangunu language name (tagi – sometimes pronounced taki, or tangi) into the species name (Pteralopex taki). In 1992, the species was yet to be described when Diana Fisher and Liz Tasker from the Australian Museum Pacific Island expedition team (overseen by Tim Flannery) headed for Seghe Airstrip, Western Province, Solomon Islands to begin what remains today the only published ecological study focussed on a species of Solomon Island mammal. Monkey-faced bats (genus Pteralopex) are unique to the geographic Solomon Islands (including Bougainville and Buka). They are medium sized fruit bats with small ears, robust jaws and large eyes, characters that to some resemble a monkey. All five known species are recognised as either critically endangered, or endangered under the IUCN RedList (the world’s most trusted and comprehensive authority on species conservation status). Tagi can be found only on New Georgia and Vangunu Islands in the Western Province of the Solomon Islands and nowhere else on earth. When Diana and Liz set off to study the species, very little was known about the ecology or life history of any monkey-faced bat. The two researchers visited eight sites over a period of three months, surveying for the bat using fine ‘mist nets’. At four of these sites they found tagi, tracked their movements and looked at their feeding behaviour and diet. This study, combined with an existing traditional knowledge, helped reveal some interesting characteristics. 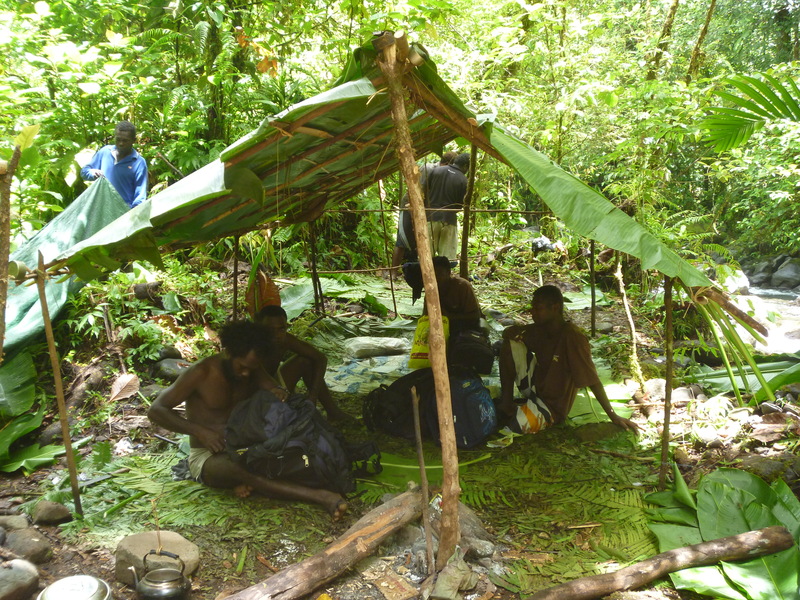 By day, tagi rest in small groups inside hollow trees and big strangler figs or abololo trees. They return to these same trees repeatedly. After the sun sets, the bats venture out to feed on forest and garden fruits as well as harder materials such as nuts. Importantly, it was found that they prefer to roost where there are ruins of former village sites where ngali nuts and wild cut nuts are common. More recently, myself and Corzzierrah Posala have returned to repeat Diana and Liz’s surveys. In the 22 year interval between 1992 and now, there have been big changes in the Western Province. Human populations have greatly increased, and industrial logging has all but exhausted the forests of Vangunu and New Georgia. 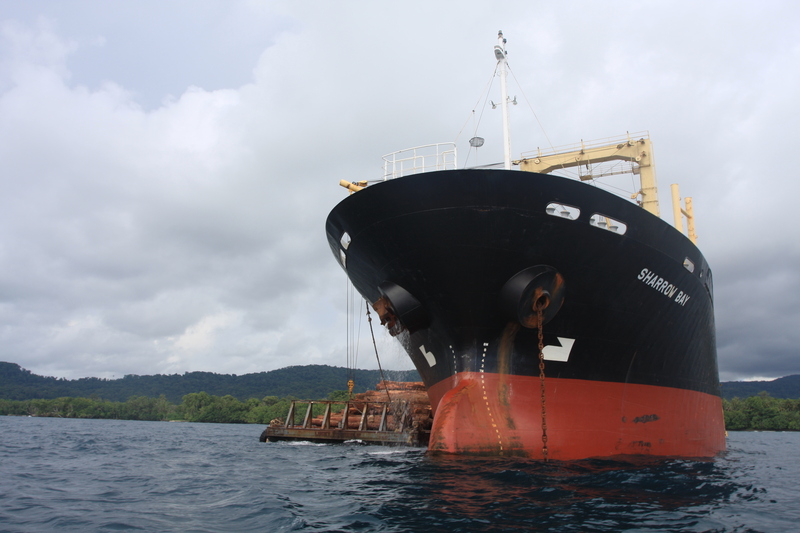 We are concerned that the logging in particular, may have had a big impact on tagi. Evidence uncovered by Diana and Liz suggested that the species once occurred on Kolombangara, but following the removal of native forests below 400m altitude, it appears the species is now extinct on that island. Using mist nets positioned at the same eight sites used by Diana and Liz, we are aiming to find out how tagi and other flying foxes are faring on New Georgia and Vangunu, and whether there have been any population changes since 1992. The existing traditional knowledge and oral tradition make it a joy to working in this part of the world. Although it is 22 years since Diana and Liz were at these sites, we are told many stories of the work they undertook when they were in Marovo Lagoon. Locating their original sites is also made easy. On most occasions we are lead straight to the exact locations where nets were positioned in 1992. Sometimes by boys that are less than 22 years old! 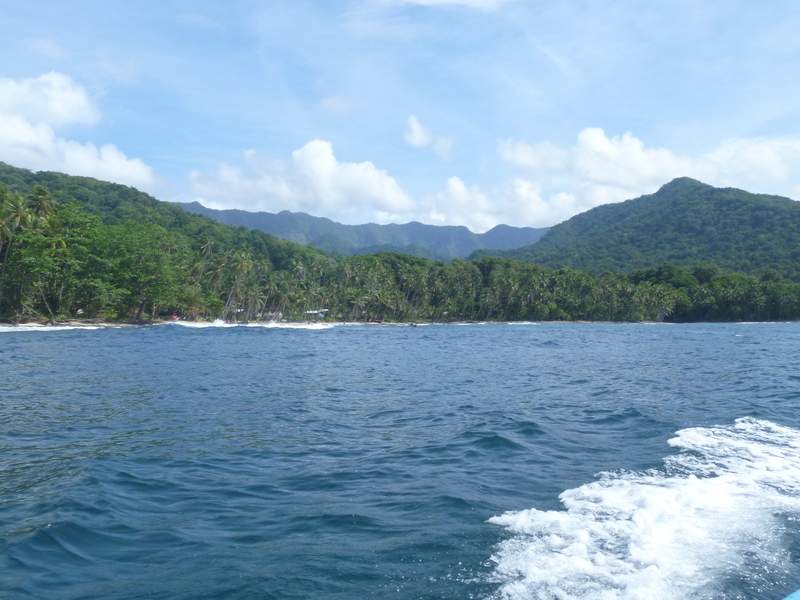 In addition to the sites surveyed by Diana and Liz, we are also looking in other parts of Vangunu and New Georgia, and on further islands to try and find tagi. Searching tree hollows with the help of local hunters is an important part of this. At Zaira, on the weather coast of Vangunu, we successfully recorded tagi using this technique. We were working at the edge of an old village site within the community protected area managed by Zaira, when one of our team members climbed a big strangler fig to look for tagi. Checking the holes in the trunk as he went, after reaching 15 metres from the ground he indicated that he didn’t think anything was inside. We were certain something must be. It was such an ideal roost tree for tagi, and it was also in an ideal location, close to ngali nut trees and a short distance from village gardens. So I began to follow, climbing the other side of the tree and checking each of the many holes with my head torch as I went. Suddenly, after reaching only five metres above the ground something began to stir. First a scrambling flash of movement went past the inside of a hole two metres above me, then again past a second hole only a metre above. Something was coming, but what? Many species share hollow trees with tagi. It could be a southern common cuscus (or kandora) (Phalanger orientalis breviceps), another species of flying fox such as Solomon flying-fox (Pteropus rayneri), or dwarf flying-fox (Pteropus woodfordi) or even a giant prehensile-tailed skink (Corucia zebrata). Suddenly, like a can of soft drink from a vending machine, a small flying fox with mottled wings and red eyes rolled out of a third, lower hole at my feet. It lay there gazing up at me and I casually picked it up and placed it into a calico bag for measuring. 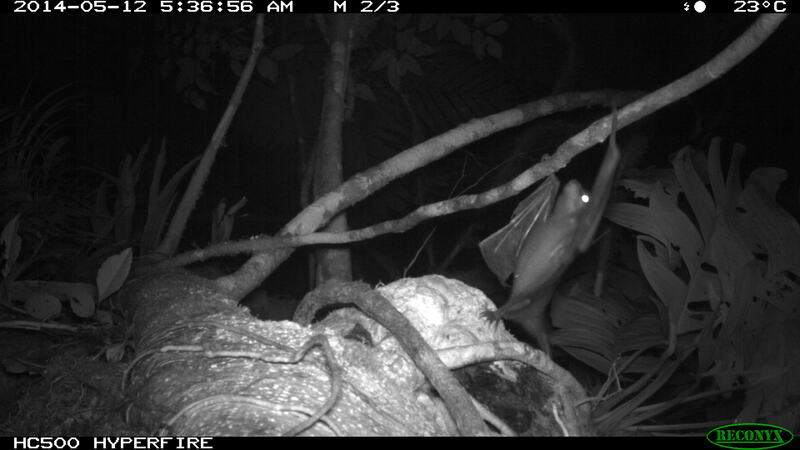 This is not unusual for tagi, they, like all monkey-faced bats are quite a gentle species compared with most of flying-foxes. They are easy to handle, and do not attempt to bite as species of Pteropus (the group to which most flying foxes belong) tend to do. 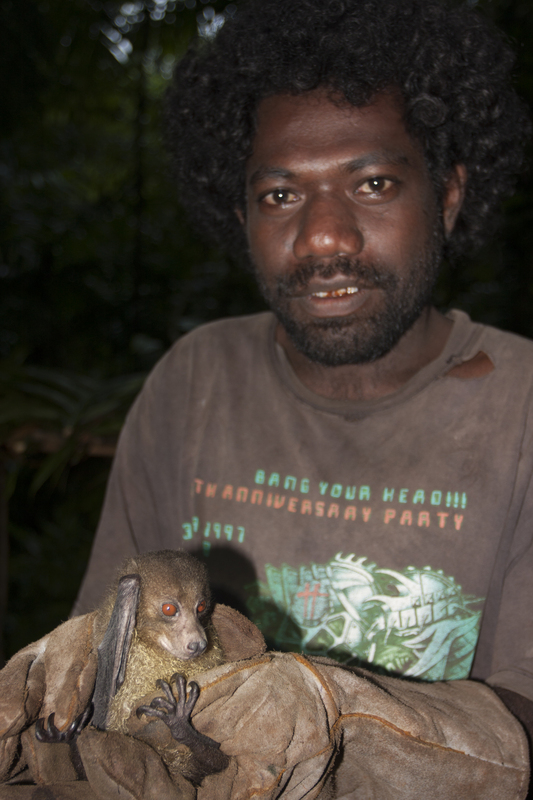 The Solomon Islands support many species of flying fox, most of which are not found outside of the region. Many of these are caught in our mist nets when we are searching for tagi. This includes larger species of flying-fox, such as Solomons flying-fox (Pteropus rayneri) and Admiralty flying-fox (Pteropus admiralitatum), Solomon bare-backed fruit bat (Dobsonia inermis) and the unique dwarf flying-fox (Pteropus woodfordi). 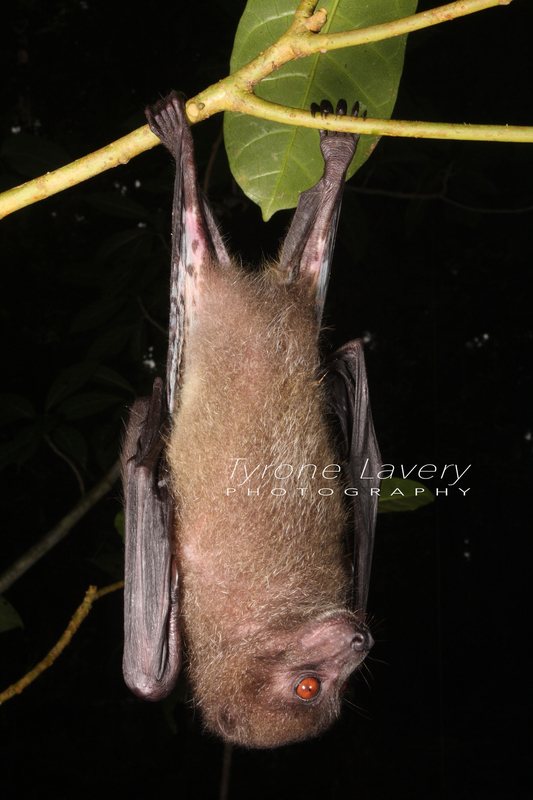 We also catch many smaller species of tube-nosed and blossom bats such as Solomon tube-nosed bat (Nyctimene bougainville), island tube-nosed bat (Nyctimene major), northern blossom bat (Macroglossus minimus), Fardoulisi’s blossom-bat (Melonycteris fardoulisi), and Rousette Bat (Rousettus amplexicaudatus). All of these species are important to the forests of the Solomon Islands. They pollinate the flowers of many species of plant, allowing them to develop into seeds. When bats eat fruits, they deposit the seeds in their droppings, spreading plants among the islands and assisting the forest to regenerate in areas where it has been damaged. Our surveys will allow us to assess the populations of many species of flying fox and look for any changes that have occurred since 1992. This is a unique opportunity in a region where little is known about the biology of flying-foxes. The good news is that in 2014 we have again recorded tagi in the sites surveyed in 1992. It remains a rare species, at most places we are able to find only one or two individuals. We were also happy to see that of the six sites where Diana and Liz caught the species, only two have been disturbed by a logging company. However, we are concerned that another two may be logged very soon. This makes it urgent for us to find out whether or not tagi can still live in forests that have been disturbed by logging. We are keen to know if leaving large strangler figs standing in logged areas and around villages might enable this species to persist. If not, tagi may decline to small community protected areas, or even disappear in coming decades as logging continues in the Western Province. These surveys were made possible through the Australia Pacific Science Foundation, Lubee Bat Conservancy and Critical Ecosystem Partnership Fund.